Many residents at Kendal at Oberlin have played active roles in the women’s movement. Last month we talked with two of them, plus Kendal’s board chair, about their experiences. Mary moved to Oberlin in 1965 and got involved with the city’s League of Women Voters. The league was a vibrant organization then, in part because educated women like Mary had limited job opportunities, so they turned their talent and energy into volunteering for social change. Then the women’s movement came, and Oberlin’s League faltered because women now had more opportunities in the workplace. For instance, Oberlin College dropped its nepotism rule that prohibited hiring wives of current faculty members. Kendal’s opening in 1993 brought many activist women back to Oberlin. They were retired and had time to devote to reviving the League. “Kendal was truly instrumental,” Mary says. After retiring in 2003 from the University of Akron, where she taught English and Canadian Studies, Mary also got more active in the League. She is currently co-president of the League of Women Voters of Ohio and a member of the Oberlin Area League. League membership is open to men (Mary’s husband Tom is a member), but the organization decided not to change the name because of its historical roots: Suffragists created the League in 1920, just six months before the U.S. Constitution was amended to give women the right to vote. The League is non-partisan, which means it does not support candidates or political parties, but instead takes positions on issues after an in-depth study. Sensible gun control laws. “This is a public health issue,” she says. 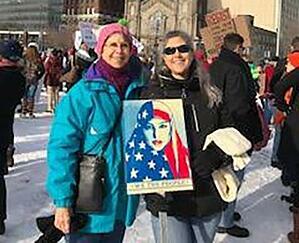 Like thousands of others, Mary participated in the March for Our Lives rally last month. “I’ve been doing this since I was 22,” Mary says. She marched in Oberlin on May 4, 1970 to protest the Ohio National Guard shooting at Kent State University that left four students dead. Marching with her was her 3-year-old son, who marched on March 24, 2018 in New Jersey with his 3-year-old daughter. “To think our students are still being killed,” she says. Now in her 70s and living at Kendal, Mary thinks back to her early years of social activism, and what’s going on today. “There was a lot of optimism beginning in the mid-1960s and many did not think we would have to fight again for the civil rights women and minorities had gained. A lot of us are dismayed at the present efforts to roll back these gains, but we are seeing a new activism today because people have begun to realize they can’t ever take their rights for granted,” she says. Kendal resident, Erika, 83 years old and a retired teacher, sat down for an interview with an Oberlin College student to talk about her activism during the early days of the women’s movement. The entire interview can be heard here. “My marriage was kind of falling apart because part of where I needed to make huge changes was to be an equal partner in the marriage. And obviously I was not considered one and therefore I wasn't satisfied. I wasn't happy. I felt I need to be me, such as Betty Ford has said, and I don't want any more anchors hanging on my side because I saw myself as somebody more than, ‘what's for dinner, honey’. Of course there was always dinner. Yes, every dinner was cooked from scratch, but that would not keep me from going to classes. Mostly I would take evening classes not to interfere with family life. I finished my bachelor's when I was 55 and I finished my master's when I was 60. Liz’s first march was at age 13, protesting the Vietnam War in D.C. with her college-age sister, her most recent was last month’s March for Our Lives, with dozens of others in between. “In the early 1970s Gloria Steinem came to Oberlin College and she encouraged us to get involved,” says Liz, a 1973 Oberlin College graduate, and now chair of Kendal’s board of directors.